Hello everybody! How was your November? December has started. So time for a brand new Dailystills. This year flew by.. I still can remember we made the Dailystills of January. This season is perfect for cozy cuddle days don't ya think;)! 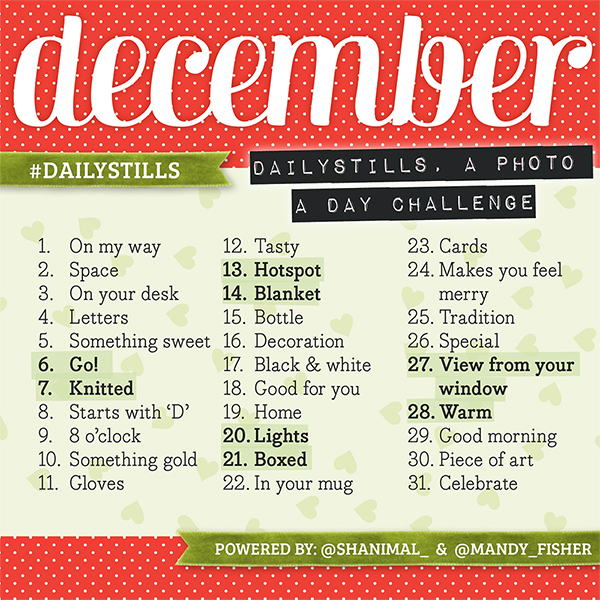 Enjoy this December Dailystills. Are you joining us in December? Let us know on Instagram :) My IG account @shanimal_ and Mandy: @mandy_fisher. You're allowed to save this photo and share it on Instagram too, enjoy! ♥ Take a photo using the prompt as inspiration. So for December the prompt for day 1 is ‘On my way. So take a photo when you're going somewhere by foot or car or anything what moves you!